Big lenticular crystal with a clear brown color and very well defined faces and edges that underline its complete contour. It has a well-developed flat pinacoidal surface and very well marked parallel growths on its rhombohedral faces. 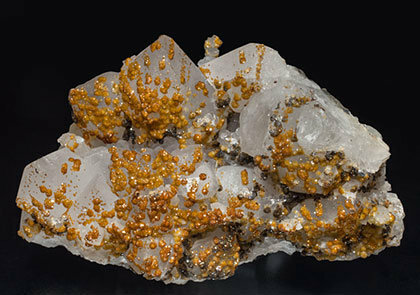 Botryoidal Siderite (variety sphaerosiderite) on matrix with very sharp platy Baryte crystals that are translucent and have geometric zoning. The sample is from the Francesco S. Stoppani collection (catalog number 0584), whose label we’ll send to the buyer. As is the case with so many specimens in this collection, the sample is of great quality for the locality. 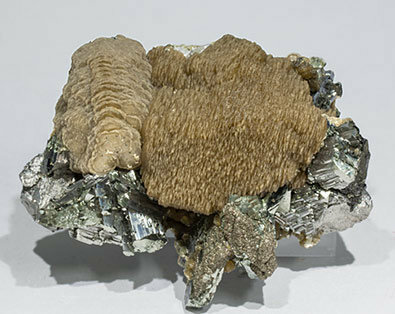 Botryoidal Siderite traditionally well known as sphaerosiderite, on a rocky matrix with bluish and very bright, laminar Baryte crystals. 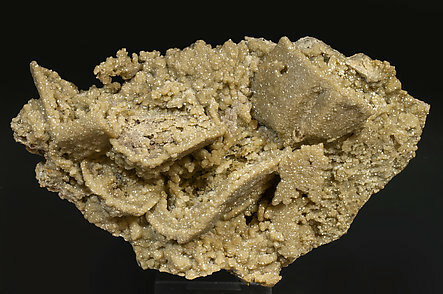 Druse of very well defined rhombohedral Siderite crystals which are cast pseudomorphs after Calcite. During the process of the substitution, wall-like external shells were left behind. The siderite casts are on matrix, with small Pyrite crystals. An very attractive group of tabular Siderite crystals with defined color zones in its peripheries. The group is on a matrix in of Arsenopyrite, Sphalerite, Quartz and Pyrite. Parallel aggregates of very flattened rhombohedral Siderite crystals on matrix, with leafy Muscovite aggregates and very well defined and bright Arsenopyrite crystals partially coated by small Pyrite crystals. The upper levels of Panasqueira are currently offering surprising and pleasant novelties, with samples that are different from what is already known. Botryoidal Baryte aggregate with a reddish color due to reddish slate inclusions. 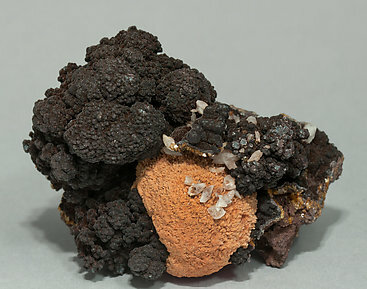 With botryoidal Siderite that has very dark brown color, almost black, and with small white and very acute scalenohedral Calcite crystals. 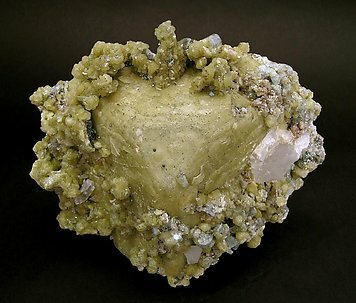 The sample is from a locality that is rarely represented in mineral collections. 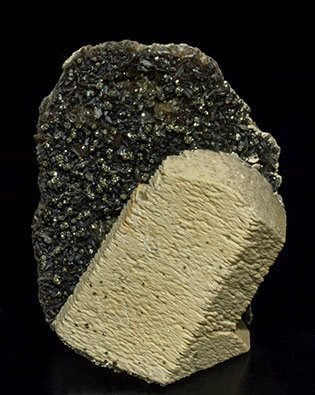 Two generations of Siderite crystals on matrix. The first forms a tapestry of small thick-tabular crystals with very well defined forms and the second is with larger polycrystalline aggregates with very curved faces. 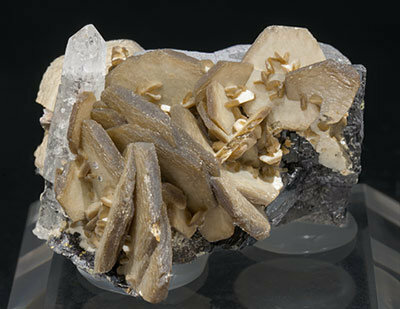 Group of lenticular Siderite crystals partially coated by Calcite crystals and with a notable aggregate of white rhombohedral Dolomite crystals with geometric growths. 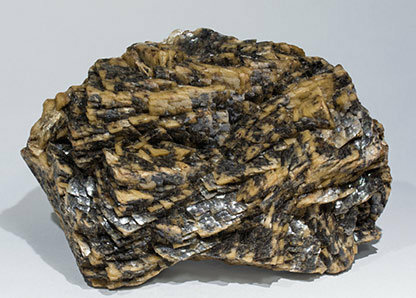 It is also with a small aggregate of poorly defined Sphalerite crystals and is partially coated by Pyrite microcrystals. Elegant, platy Siderite crystals with a warm brown color. They are implanted on a twinned Ferberite crystal and are with transparent colorless Quartz. 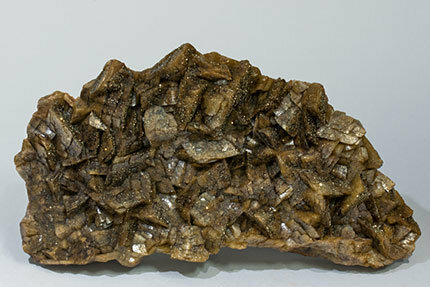 Floater rhombohedral Siderite crystal with apparent foliations that really are recrystallizations. 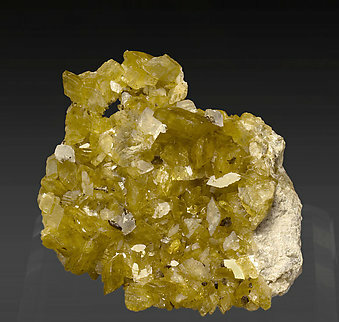 Its honey color and the transparency are not usual for Siderite from this mine, generally it is more opaque. 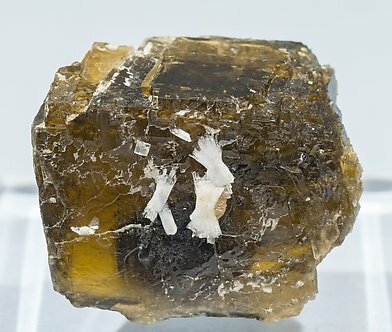 There is an associated growth of uncommon doubly terminated Fluorapatite crystals, between translucent and transparent, bright and white in color. These unexpected Fluorapatite crystals have been analyzed and we will send a copy of the analysis to the buyer. A very large crystal. Its color is lovely and the trigonal symmetry is clearly revealed by its triangular central face. 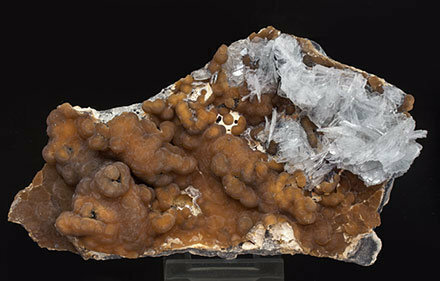 On the surface of its faces appear, recrystallized and with color zoning, some little crystals of the same Siderite with Fluorapatite and Quartz. 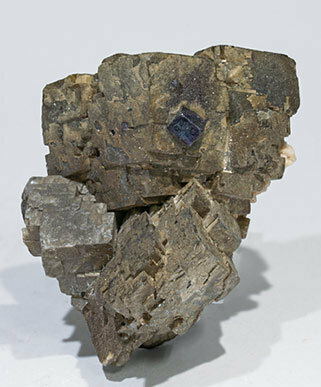 Aggregate of very Sharp rhombohedral Siderite crystals, with polycrystalline growths and a single cubic Fluorite crystal, transparent and with a blue color and violet color zones. We note the locality which is really uncommon. The sample is from the Francesco S. Stoppani collection (catalog number 0614), and was previously in the J.H. Marshall Jr. collection (catalog number 2640). We'll send to the buyer the Stoppani label and the label and card from the Marshall Jr. collection. As is the case with so many specimens in this collection, the sample is of great quality for the locality. 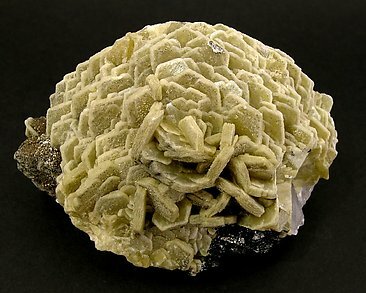 Echeloned growths of rhombohedral Siderite crystals with a clear cream color and darker areas due to inclusions. As is the case with so many specimens in this collection, the sample is of great quality for the locality. 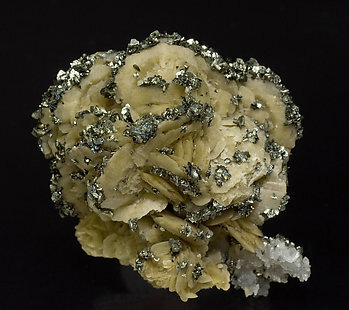 Nice rosettes of Siderite partially covered by flattened crystals of Marcasite that show, very well marked, the twin known as "cockscomb" and with minor Quartz. 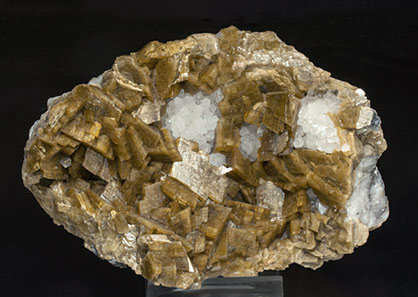 Aggregate of rhombohedral Siderite crystals with slightly curved faces and very bright and “paved” surfaces partially coated by small Pyrite crystals. It is an excellent German classic for the species and the locality. As is the case with so many specimens in this collection, the sample is of great quality for the locality. 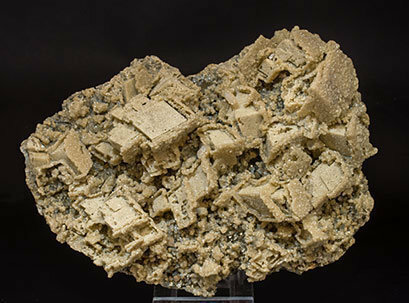 Growths of small Siderite crystals outlining the rhombohedral forms of much larger platy Siderite crystals, a product of crystallization of a second generation upon a first generation. 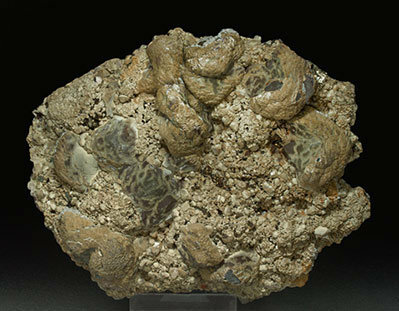 Typical of samples from the extinct Turt mine. Group of lenticular crystals that have a very contrasted doubly coloration, with both dark and yellowish-brown areas. They are on matrix, with small crystals of Pyrite that are complex, with the predominant forms of the octahedron. 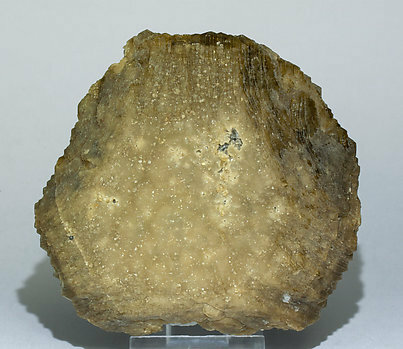 Elongated Siderite crystal with very well defined growth striations and good terminations, the lower one bordered by small cubic pyrite crystals. 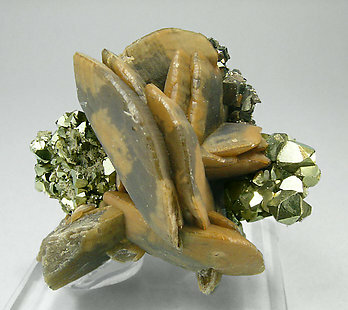 It is on a matrix of leafy Muscovite with Pyrite crystals. 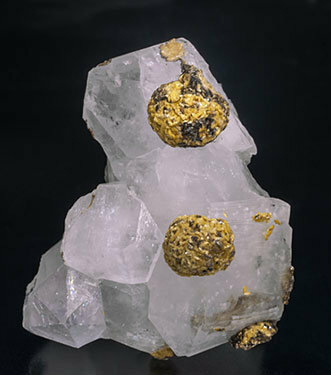 The sample is very representative of the Siderite from the Morro Velho gold mine, samples that were relatively abundant a few decades ago and very scarce today. The lenticular crystals, very sharp, have an excellent color and intense luster. 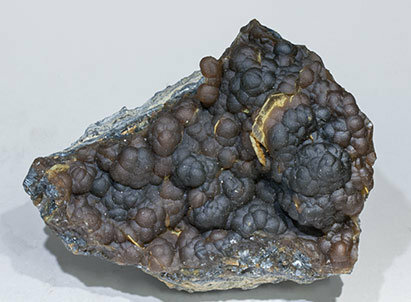 Thick tabular Siderite crystals with pinacoidal terminations and flattened rhombohedral faces. 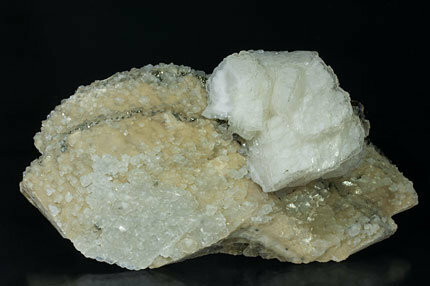 They have a clear cream color and are with Quartz crystals with inclusions of Muscovite microcrystals. The sample is, very probably, one of the latest to be incorporated in the Daunis collection by Daunis’ wife Maria. We’ll send to the buyer a commercial label that is with the sample. Partial coatings of lenticular Siderite crystals that are very bright and have grown on Quartz crystals that have a very short prism. 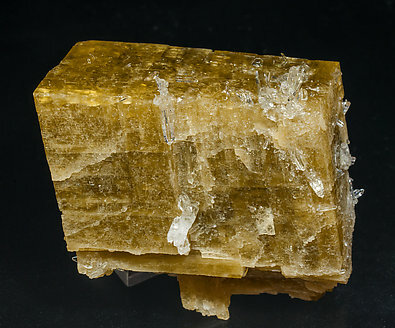 Elongated and floater rhombohedral Siderite crystal. 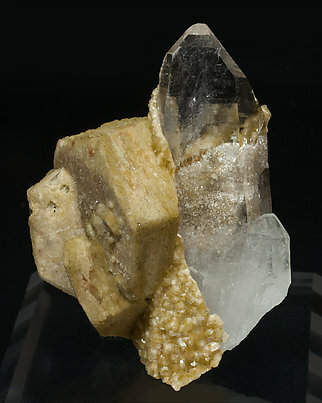 It is translucent, bright and partially coated by small clear Quartz crystals. The sample, very typical of its classic French locality, is from the Christophe Marot collection (cat. nr. C7-2), whose label we’ll send to the buyer. Aggregate of very sharp and well defined rhombohedral crystals with echeloned edges. They are very bright, have a clear brown color and are on matrix, with very well defined Quartz crystals. As is the case with so many specimens in this collection, in this case a German classic, the sample is of great quality for the locality.